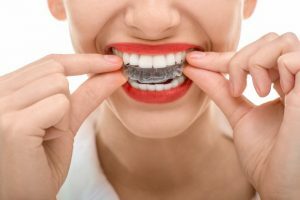 To correct bite issues and misaligned teeth, clear braces use traditional orthodontic techniques to resolve your smile and function issues. At Thurloe Street Dental and Implant Centre, we understand that as an adult you’d rather not have to wear obvious, metal braces so we offer clear braces, coloured to blend in with the teeth. Clear braces are the best option for patients who may have complex orthodontic issues which require a longer period of treatment. This type of brace corrects functional issues as well as the alignment of teeth. Ceramic brackets are affixed to the teeth and a wire is attached to each individual bracket. The wire is tightened at various intervals during treatment to help your teeth gently move into place. Once the braces have been removed, we will provide you with a retainer so that you can maintain the new position of your teeth.